Man Ray, Jagwar, Dreadmon, Mondo Gecko, Wingnut and Screwloose have been knocked unconscious by a group of skeletal robots controlled by the evil corporate weasel, Mr. Null – the devilsih dude hellbent on ruling the universe. Leatherhead and a shape-shifter named Azrael are still standing, but the gatorman’s gun runs out of ammo and he is overpowered by the cybernetic psychos. Azrael changes into an eagle and escapes. Before Null can kidnap the Mutanimals, the TMNT, Ninjara and Splinter show up and the fight is renewed. A laser beam that Leo deflects with his swords nicks Man Ray’s shoulder which awakens the mutant and he joins the fray. Eventually all of the Mutanimals recover and battle escalates. As laser beams and robot body parts fly, Null manages to capture Azrael when she returns to human form and punches her in the face. Null then carries the unconscious woman through a secret doorway hidden in the nearby rocky hills. Mr. Null meets with four shadowy figures, the foremost looking like the Grim Reaper, who states that the group is ready. 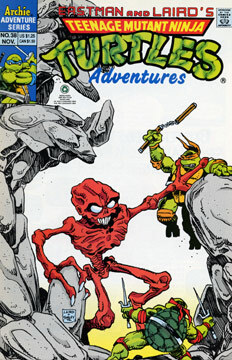 Meanwhile, with the help of the Turtles, the Mutanimals finish mopping up the Robo-Skeletons. As the group exchanges greetings, Jagwar notes that Azrael is missing. Leonardo points out that Cudley is also gone and wonders if they’re together, but Dreadmon states that he saw Azrael flying off in her eagle form. Man Ray then explains that the Mutanimals have come to this place to search for Jagwar’s mother, Juntarra, who was kidnapped by the Grim Reaper. A nearby giant skull is where they believe the Reaper to be – but when they found it, Null’s robots attacked them. Thus the fishy mutant surmises that Null is working with the Grim Reaper. Jagwar points out that the stoney desert they’re now standing in was a lush tropical jungle before the Reaper arrived. Ninjara notices a fire in the jungle far off and everyone rushes to investigate. Continued in The Mighty Mutanimals #6.